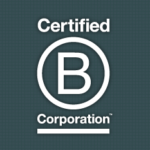 Mightybytes reached two great milestones in our ongoing journey to use business as a force for good in the world: we were included in B Lab’s Best for the World list and crossed the 100-point threshold in our B Corp certification score. We are very excited to be included in the 2017 list of Best for the World companies, which Forbes magazine calls The Most Important List of Businesses in the World. The Best for the World list—which included 846 companies spread across 52 industries in 30 countries—honors businesses that redefine success by competing to be not just best in the world, but best for the world. This list is based on the Governance section of the B Impact Assessment, which evaluates a company’s overall mission, ethics, accountability and transparency. It measures whether the company has adopted a social or environmental mission, and how it engages its employees, board members and the community to achieve that mission. This section assesses employee access to financial information, customers’ opportunities to provide feedback, and the diversity of the company’s governing bodies. 186 companies were included in the “Best for the Long Term” list. We’re excited to be a part of this particular list because it recognizes that Mightybytes’ commitment to operating a sustainable, triple-bottom-line business which strives to treat all its stakeholders well is not a short term fad or something we do just for marketing purposes, but rather an intentional, vision-driven strategy that grows and evolves over many years. We are grateful to B Lab for the recognition and congratulations to the other 845 Best for the World companies, especially our nearby neighbors and friends: StoryStudio Chicago, LimeRed Studio, Rumi Spice, Method/People Against Dirty, Appleseed Capital, Flowers for Dreams, and Yumbutter. It’s good to be in great company! 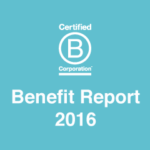 Since becoming a Certified B Corp in 2011 we’ve had our sights set on reaching a score of 100 points. We came close in 2013 with a score of 98. Each new version of the B Impact Assessment, however, is intentionally more difficult than the last—it is a benchmarking tool, after all. During our last recertification—our third—we tumbled 16 points, a sobering reality check that, as noted above, running a future-forward, stakeholder-driven business is a long term commitment, not something you think about every couple years. Having just completed our fourth certification, we are super excited to share that we have finally crossed the 100 point score mark. We’re ahead of many other typical businesses our size, but there is always room for improvement. 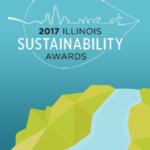 Being Best for the World preceded receiving an Illinois Sustainability Award by just a few weeks. While we are thrilled at these milestones, they are but a small step in a very long journey to fulfill the global B Corp community’s audacious vision: to create a shared and durable prosperity for all of society. So we humbly accept our accolades…and diligently return to the hard work at hand.